Homes in Helsinki will soon be heated by heat extracted from waste water. After domestic waste water has been treated at the Viiki sewage works, it will pass through one of five heat pumps built under Katri Vala Park. Its heat is removed, concentrated and used in domestic heating. Using a heat pump such as those used in domestic geothermal heating systems is very energy efficient with up to 5 units of heat energy generated for every 1 unit of energy needed to run the pump. The heat is free since it would simply be lost to the ocean if it were not extracted before the treated water is pumped away. In the summer time the process can be removed and the coolness of waste water (relative to the ambient air temperatures) can be captured by the heat pumps and used to cool homes. The heating output of this plant is 90MW, and the cooling output 60MW. This makes it the world’s largest chiller heat pump installation. 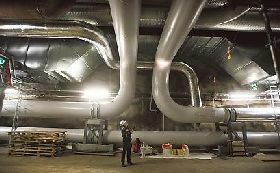 The Katri Vala Heat Pump Plant is a Helsinki Energy project costing almost 35 million Euro and was half financed by the Finnish equivalent of the UK’s DTI. Though expensive, the plant will pay for itself in the energy it saves whilst helping reduce carbon dioxide and other greenhouse gas emissions. Building the heat pump plant has taken almost three years during which a 10,000 square metre area of granite rock had to be blasted out underground to house the equipment and kilometres of water piping. The plant will be officially inaugurated in March 2007.